Few fundraising specialisms hold more promise than the development of potential major donors. Equally, few areas of fundraising have hitherto been so neglected. 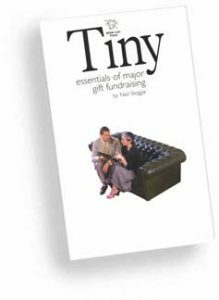 In this natural successor to his first book, the highly acclaimed Tiny Essentials of Fundraising, Neil Sloggie explains and illustrates the tiny essentials of an extremely important area of fundraising. This time he tells the story of Daniel, chief fundraiser at the Clean Green Fund for the Environment, who had never thought of asking any donor individually for money, nor of asking for more than a three-figure sum. Through Daniel’s experiences, Neil shares his extensive knowledge with other fundraisers. He describes all the stages of a major gift programme from the initial research – and how to go about it – through to donor cultivation and solicitation. He even describes the pitfalls you could face when you achieve success. This little book contains in their purest, most distilled form the priceless secrets of a vast fundraising opportunity. Like the other ‘Tinys’, it can be read inside an hour, leaving you free to put its lessons into practice immediately you put it down.